Located in the southeastern part of Alabama, Geneva County is a comfortable rural community, striving to preserve the charms of small town living while planning and working for a better tomorrow. Geneva County is an affordable location for a high quality of life — just minutes away from Dothan, Enterprise and Ft. Rucker in Alabama and Panama City, Destin and Ft. Walton in, Florida. Geneva County’s easy access to these metropolitan areas provides many opportunities while allowing businesses and residents to enjoy small-town living. Geneva County is home to the Geneva Festival on the Rivers and the Slocomb Tomato Festival. Known as the Junction, the Choctawhatchee and Pea river conjoin in Geneva and offer some of the best hunting and fishing in the country. The most recent census reflects a population of 26,790. 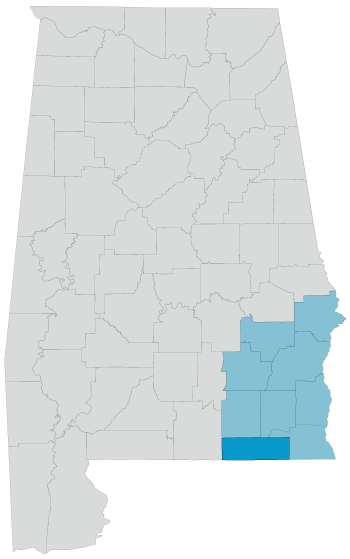 The major cities and towns in Geneva County include Slocomb, Malvern, Hartford, Samson, Coffee Springs, and the county seat, Geneva.